One hundred years ago the Armistice was signed between the Allies of World War 1 and the German Empire. The cessation of hostilities took effect at 11.00 am on 11th November 1918. This year marks the centenary and Remembrance Day is commemorated across the UK. In our Benefice on Norfolk, we held two main services with packed churches and two minutes silence at 11.00am. Even the traffic stopped on the road for us this year. In the evening two large bonfires were held and again huge numbers of people gathered to watch and the church bells rang out at 6.50pm to join in across the UK. This was followed by singing the old songs and enjoying a glass of wine and some cakes and listening to stores of people from our village who went to war and never returned. The first verse of the poem by Rupert Brooke, written in 1914, is a reminder of that time and the young men who gave their lives in the trenches in France and Belgium. Washed by rivers, blest by suns of home. 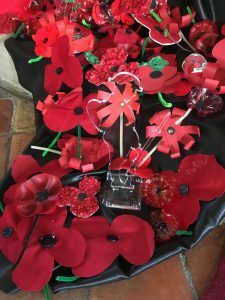 This entry was posted in community, Faith goes walkabout, Remebrance and tagged 1914, church of england, faithgoeswalkabout, gayton group of parishes, norwich diocese, Remembrance, Rupert Brooke. Bookmark the permalink.